The only customs made for this story, the Deathwrites, were done in photoshop. 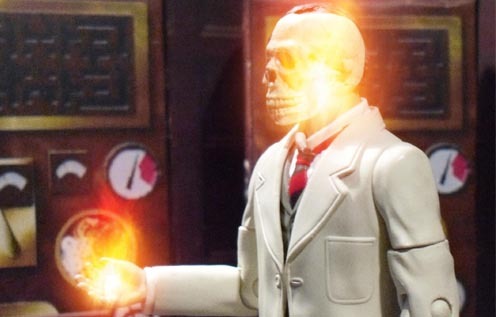 They consist of the Pyramids of Mars Priory set Professor Scarman, his head replaced by the skull from the An Unearthly Child set with added photoshop fire. For the prequel The Deathwrite Prophecy, I needed a custom of The Grey Lady. 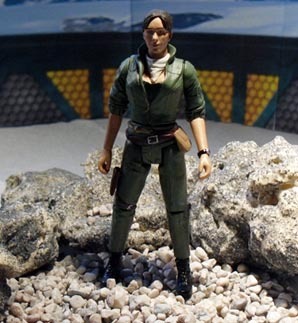 This is basically an Idris figure with the head from Jenny from Primeval. She still has Idris' hair do. She's a character that I've had in my head for a very long time. She will very likely make a return appearance and you'll discover her name then. For now, we'll just call her the Grey Lady. 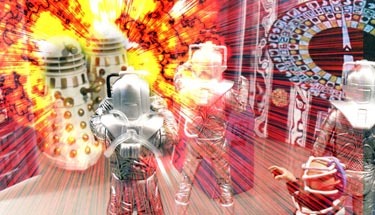 It was always my intention that at the climax, the Daleks and Cybermen would actually join forces, at least for a while. 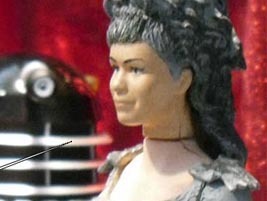 I've thrown everything at this series and Davros was the final piece that had to be included. With hindsight, I should probably have found a place for the Mechanoids at some point and certainly the Special Weapons Dalek. As well as being the finale to the Dalek v Cybermen series, it's also the finale to last year's 7th Doctor arc. 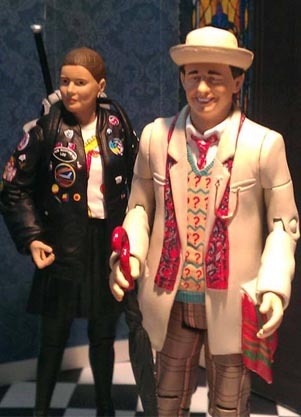 In fact, it's the culmination of a 7th Doctor arc that's kind of been going on since 2010, ie what happened to Ace? There were two versions of the script. The first was written in the hope that we would get an Ace figure. The second version was in case we didn't. I'd planned to shoot both versions, allowing for Ace to be slotted into the necessary frames. As it turned out, an Ace figure was announced before I began filming. In the alternate version of the script, instead of Ace in the comet, there's a Deathwrite Wraith that 'destroys' the TARDIS. 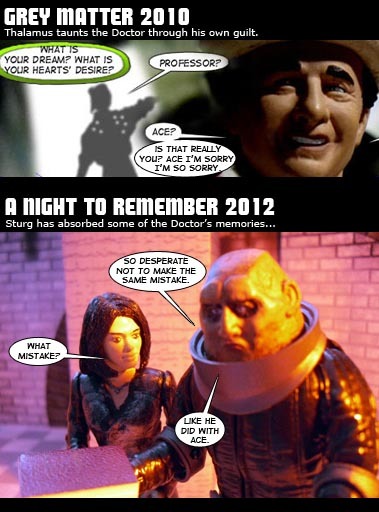 The story then proceeds in the same way with most of Ace's dialogue given to Torchwood. 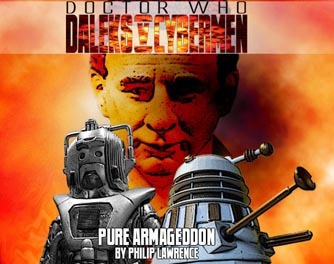 Both versions of the script allowed for two endings, where either the Cybermen or Daleks acheived ultimate victory- the ending to be decided by reader vote. As with the rest of the Daleks v Cybermen saga, filming began on 8th October 2012 with the interior of the Dalek saucer. For this story, it continued on 9th October too with the interior of the Dalek orbital facility where Torchwood and Belinda are first captured. I started to shoot the Cyberman ship interiors (along with those for the other stories) on 22 November but it quickly became apparent that this story needed more figures (specifically Ace) so shooting stalled for a bit. It wasn't until 10 June 2013 that filming resumed, this time with the planetoid's surface scenes from part one. The planetoid surface uses white crepe paper for the snowy floor and a back drop showing the ice mountains and the boundary of the facility. I added Dalek pillars and consoles to make the Dalek base. Obviously, I didn't have Ace at this time but I was keen to continue filming so I carried on using Helen Cutter as a standing, planning to overlay the Ace figure after. This was a flawed idea and that footage was abandoned. Similarly, on the same day, I began shooting the planetoid interior corridor scenes for the non-Ace version. Mainly because it was needed for a panel in The Coming of the Comet but I must have been having a fatalistic moment where I suspected Ace would be delayed beyond Christmas. Filming was held off until 13th October. Now with Ace firmly in hand we could shoot properly and resumed with the Dalek base on the planetoid where Ace reveals the Armageddon. This filming block ended with a couple of quick shots of Torchwood tumbling down the rabbit hole and Belinda approaching Cause and Effect. 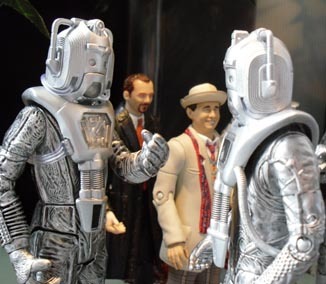 The biggest shoot date was 16th Oct beginning with a reshoot of the Ace scenes on the planetoid's surface involving the destruction of the TARDIS, continuing with the Cyberman bridge (2 versions with different victors), the cargo hold scenes and then the Deathwrite control room/ corridor scenes. The Deathwrite control room uses a combination of the Priories from Pyramids of Mars and Image of the Fendahl with specially made 'steam punk' computer banks. On 18th October I resurrected the 'vaulted corridor' set. This is basically the same set I used for the corridors as they were seen in Empire of the Time Lords but with stone pillars and foliage added to age them. 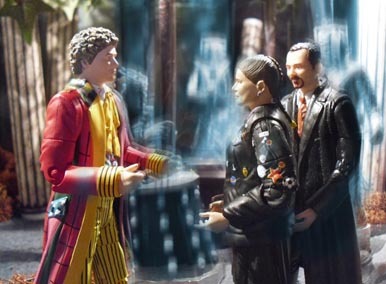 That set was kept and redressed for 23 October where bits of the 8th Doctor's TARDIS were added and then the model of the Eye of Harmony (as it was seen in the TV Movie) and then finally the 'tent peg' where the clone 6th Doctor sacrifices himself. Editing was done pretty much as the footage was shot with each scene being slotted in non-linearly. The exact ending wasn't decided until it was edited on 15th December. 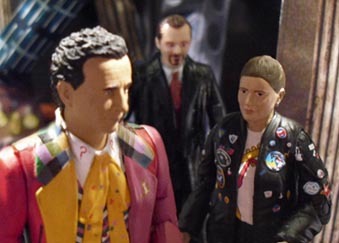 I had hoped to show the Doctor and Ace inside the TV movie console room but it was far too much effort to put it together for just one panel. In the run up to publication, I ran a daily advent calendar with some secret downloads plus hints and clues about the story. See right for the explanations. This also included two prequel episodes, The Deathwrite Prophecy and A Better Life. Technically, these are the AFT's 100th and 101st stories, but I've included them as part of Pure Armageddon so that story gets the 100th accolade. As with all my 'event' stories, it was posted 1 episode per day from 25th December to the 29th. 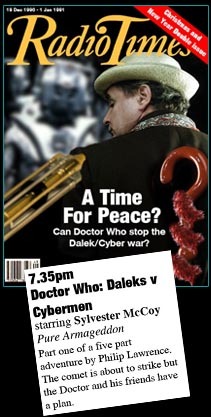 Until the episodes were posted, there were 'Radio Times' cuttings in their place as placemarker images. The Doctor will be changed. Forever. This of course refers the fact that the Doctor is killed and replaced by a clone. In continuity terms, nothing has changed but (for now at least) the Doctor has no recollection of seasons 23-26. The destination of the comet is somewhere we've been before. The planetoid created by Omega in Empire of the Time Lords. Apart from the original Doctor, this is referring to Belinda, who sacrifices herself at the end. Two AFT characters will make a return. We're talking of course about Cause and Effect as first seen in Paradox Lost. This story takes place after last year's 7th Doctor trilogy, itself taking place some time between Survival and the 1996 TV Movie. The flashback to the Deathwrites takes place sometime after Survival.